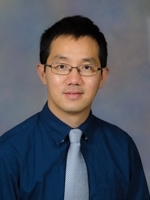 Jing Guo received a Ph.D. degree in electrical engineering from Purdue University in 2004, an M.S. degree in solid state electronics in 2000 and a B.S. degree in electronic engineering in 1998, both from Shanghai Jiao Tong University. He joined the University of Florida as an assistant professor in Aug. 2004. His research interests focus on modeling and simulation of new nanoscale devices with applications in electronics, optoelectronics, and energy conversion. He is a recipient of the National Science Foundation Faculty Early CAREER Award.